Huge demand for tickets to the first screenings of Star Wars: The Force Awakens has put a strain on cinema websites. Odeon and Picturehouse said their sites were affected, with Picturehouse saying it had seen "unprecedented" demand. Some people took to Twitter to complain about sites crashing. However a Vue spokesman said it had sold 10,000 tickets in 90 minutes, adding "our customers continue to purchase online with ease". The new film, which hits cinema screens on 17 December, is one of the most anticipated titles of the year. 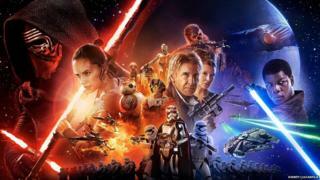 It reunites stars from the original trilogy of films including Harrison Ford, Mark Hamill and Carrie Fisher. Advance tickets went on sale this morning, but the volume of people trying to buy them was too high for website servers to cope. Picturehouse spokesman Gabriel Swartland said: "We're working on it, we've had an unprecedented demand for tickets." He said the last title to cause such a surge in demand was a screening of the Barbican's production of Hamlet, starring Benedict Cumberbatch. "We've had concurrent bookings in the thousands," he said. "On the plus side we already have sell outs. We expect it to calm down later in the day." An Odeon spokesman said: "We're seeing massive traffic to our website this morning as guests book ahead for Spectre and Star Wars: The Force Awakens. "We knew this morning would be very busy and did as much as we could to prepare. Thousands of guests have already successfully bought their tickets. "There have been some booking delays in the initial peak, but our website is now returning to normal speed." Ailsa Scott said on Twitter: "Is 'I'm sorry, I was trying to book Star Wars tickets but the Odeon site kept crashing' a valid excuse for being late for work?" Joel Tennant added: "The Force is not strong with the Odeon website today. Took Yoda's advice too literally they did; load or do not, there is no try."